I’ve seen this graph a couple of times in my daughter’s school. It breaks “mood” into two axises. Feeling is, the x-axis, and energy is, the y-axis. I’m not sure how psychologically valid this is. It would seem some moods might be hard to place; and vice-a-versa, some regions of the graph would be tough to map to an emotional state. For example, what emotional state would the origin be? 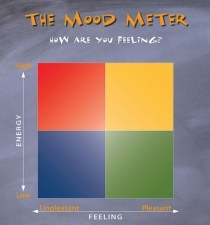 However, the mood meter, like a lot of mathematical models, derives it’s usefulness from its simplicity. I had a great time bringing this into one of my Elementary Algebra classes the other day. Everybody was talking about their quadrant . 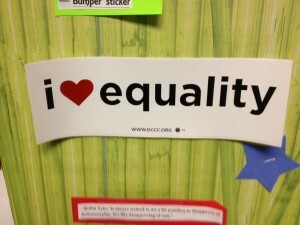 I know whoever created this bumper sticker was thinking of social equality, but I have to steal this for my classes. I passed by it on a bulletin board at Tunxis, and it honestly took me a few seconds to realize it wasn’t referring to mathematical equality. 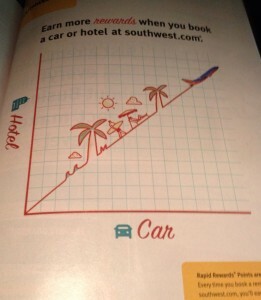 I wish the pic I took was slightly better, but here is a Southwest Airlines ad I caught in their in-flight magazine. I doesn’t make any sense as a graph. I have to give them points for a cool visual though. I used to drive by a house with a street address of 169 on the way to work. It always made me think, “why can’t I have a perfect square for an address?” Imagine how jealous I was when I saw this. A baby 8 pounds, 9 ounces was born on 10/11/12 at 13:14pm. How cool would that be? The mathematical stars shine bright on some. Here is link to a Today Show post on it. Thanks, Colleen, for sending that my way! I was hanging out with my cousins in Boston and in conversation they referenced a dating convention I’d never heard of. 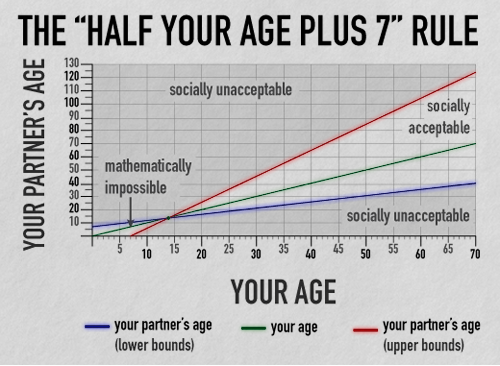 Apparently you’re not supposed to date anyone less than half your own age plus seven. So if I’m 40 right now, half my age is 20, plus 7 is 27. I can’t date anyone younger than 27. Being a geek, I immediately thought cool function! It is interesting that this also sets an upper bound on who I can date. If I date an older person, I can not be less than 1/2 his/her age plus seven. So that means I can’t date anyone older than seven less than my age times two. I found a cool graph of both one’s upper and lower dating limits at Bellesouth. Does any one know where this comes from? I found a great Flickr photo group via Free Tech for Teachers. 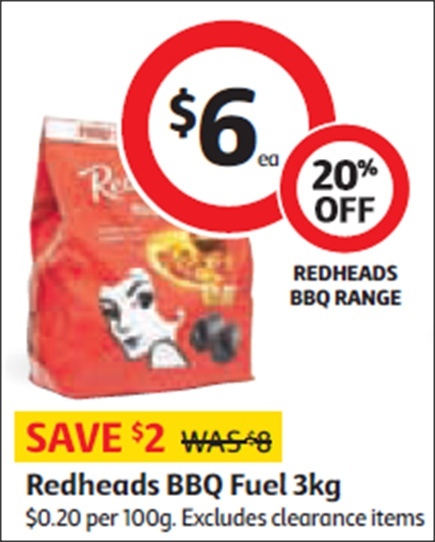 It is called Bad Maths, and is a place to post pics of the crazy math sometimes sees when shopping. Danny Nicholson, the groups admin, uses it in class as a warmup. There are some really good ones. Definitely worth a few chuckles. A quick post while on vacation. 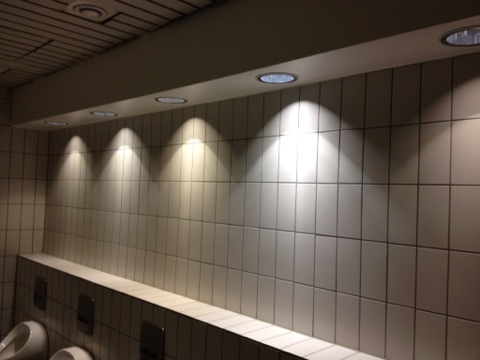 Look what I found in a mens room in Frankfurt’s airport–a beautiful sequence of double parabolas. Math is everywhere! I found a sine sink at the Brevard County Zoo on spring break in Florida last week. Need one for my house. That would be the ultimate in math home decor. 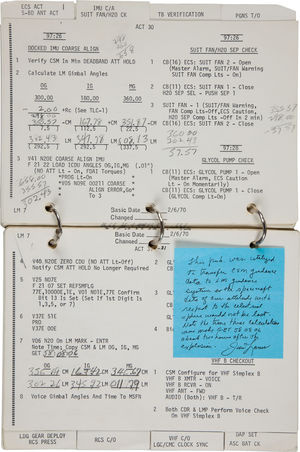 Commander James Lovell’s arithmetic scratch work in one of the Apollo 13’s manuals sold a little over a year ago for $388,375. 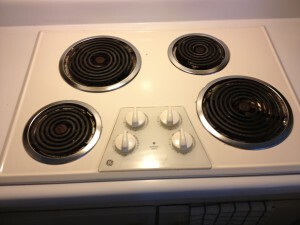 Check out this Gizmodo article. Particularly poignant is the transcript of the radio dialogue between Lovell and Houston as he is asking them to check his work. Any slight error could have meant death for the astronauts aboard. Talk about high stakes testing! …also wondering if this is the most valuable mathematical artifact out there?